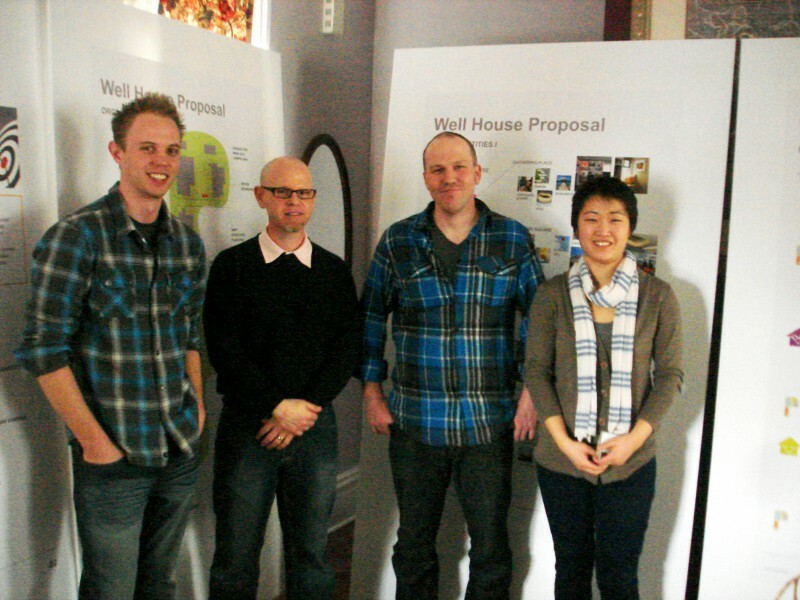 The Design Team from Steelcase has completed a pro bono project which will help Well House as it transitions from a shelter to permanent housing. If you would like to get involved with Well House as a skilled (or skills-building!) volunteer, please contact Well House at 616-245-3910 or [email protected] - ask for Therese Kent or Judi Buchman. If you are interested in learning more about Encore, skills-based volunteering, or how to get your company team involved in the Vision to End Homelessness, please contact Teresa Zbiciak at the Volunteer Center at [email protected] or by calling 616-459-6281 ext. 664. In the living room of an old house – one of three owned by Well House—five 4-foot-by-8-foot Inspiration Boards stand propped against walls, windows, and doorways. A crowd of representatives from Well House and the Volunteer Center have gathered in front of them, curious and eager for an interpretation of the colorful layouts, lines, and diverse array of images. 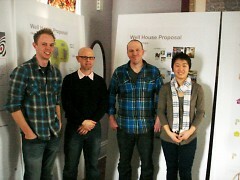 The Inspiration Boards are the result of several months of pro bono design services that The Design Team at Steelcase has provided for Well House, helping the former shelter re-envision its living and work space. The project has become somewhat of a flagship as the Volunteer Center works to significantly increase the number of skills-based volunteer opportunities in the community, particularly with organizations that provide housing, such as Well House. 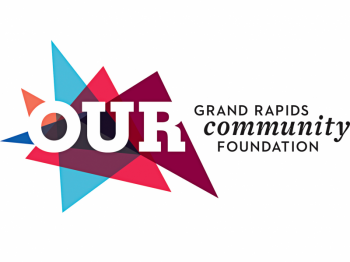 As housing and shelter providers in Grand Rapids address the complexities of a complete system overhaul, there is tremendous potential and need for innovation in order for the Vision to End Homelessness to come to fruition by 2014. That is why this successful pro-bono design project holds such promise. “Rather than focusing in on some specific element or elements of the living spaces – we decided to think more broadly about the paradigm shift of an organization transforming from an emergency shelter to permanent housing,” Hyun Yoo, the Design Team’s lead designer explains. 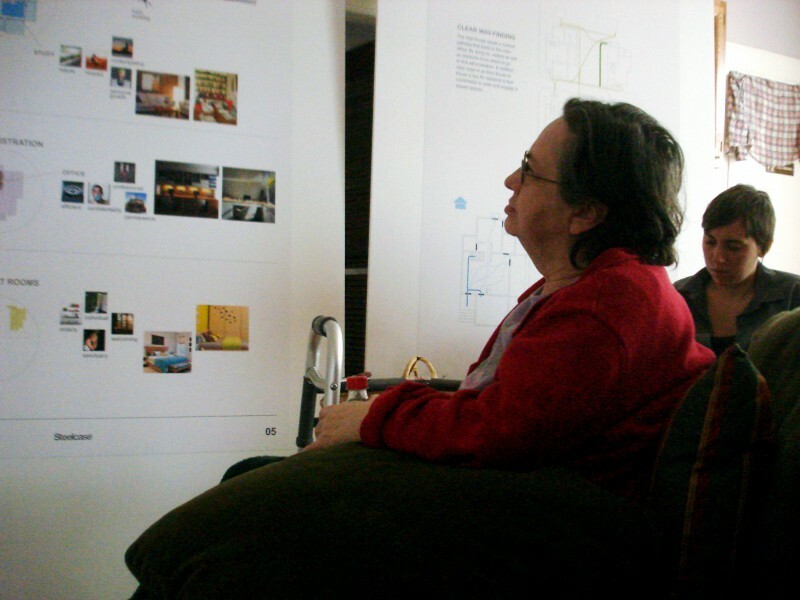 The Design Team has worked diligently, synthesizing information from several visits and interviews with staff and residents, who had identified many opportunities to improve their use of space. Key design principles guided the creation of a holistic, intuitive and organized layout and strong community identity. 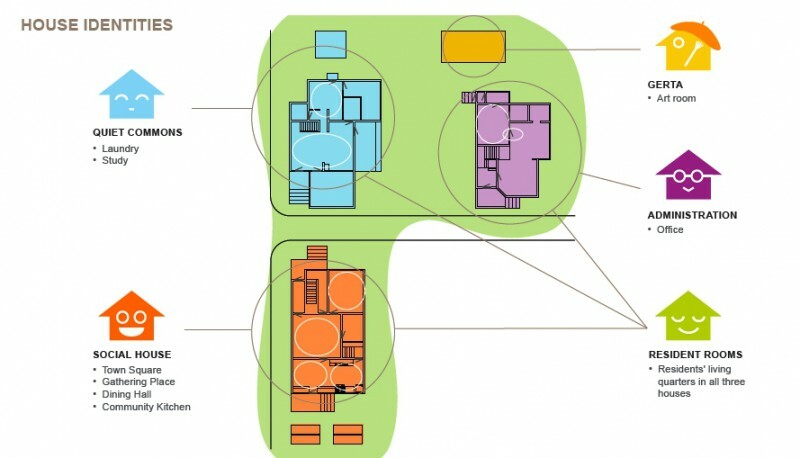 In the proposal, each house is given a new character, with a new purpose, creating a sense of community by providing space where people can gather together. 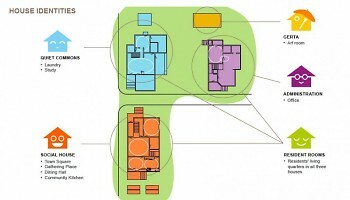 The design plan establishes specific functions for each house, and notates the natural flow of traffic to different “destinations”. The house with the big community kitchen becomes the Social House. Across the street, a few adjustments and some heavy lifting create a Quiet Commons for studying and laundry. Next door, administrative offices replace a children’s play room that is no longer as needed as it was when Well House was a shelter. The designers share in their enthusiasm, and also express how beneficial the experience of creating the project had been for them. The team members rarely, if ever, have the opportunity to work together on a single project, particularly one where they could work towards such a specific goal. From here, Well House staff and residents can readily identify projects for moving forward based on the Design Team’s proposal. Well House is collaborating with the Volunteer Center to match volunteers with a spectrum of skills-based and traditional volunteer opportunities on United Way's Day of Caring and throughout the year. Well House is also looking to create an Encore Team to help create new partnerships within the community as a part of this exciting new venture for these organizations and towards the Vision to End Homelessness. It is an exciting place to start. Disclosure: Teresa Zbiciak is a VISTA with the Volunteer Center at Heart of West Michigan United Way.